We previously informed you that Johnny Manziel, whose legendary status at Texas A&M resulted in the 2012 Heisman Trophy, but quickly diminished with the Cleveland Browns, had been given a second chance in the CFL with the Hamilton Tiger Cats. Well, as they say in the business, we have an update to report. 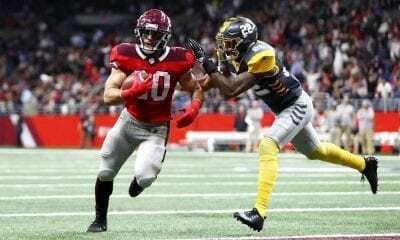 Not only was Manziel traded to the Montreal Alouettes on July 22, but he has been promoted to starting quarterback and will make his debut on Friday night at home against the Tiger Cats. Yes, there is an excellent chance highlights will be on an endless loop somewhere soon after. Stay tuned. What’s more, Montreal’s head coach is Mike Sherman, the former Green Bay Packers coach, who had a hand in recruiting Manziel to Texas A&M when he was the head coach there from 2008-11. Sherman’s last year was Manziel’s redshirt year. It bears repeating. Sometimes, it’s not what you know, but who you know. It seems Sherman and the Alouettes are knee-deep in trouble at 1-5. And so they are turning to the charismatic Manziel, whose popularity among CFL fans mirrors Tim Tebow’s in Florida, for help. Montreal thought so much of Manziel, a bench-warmer for six weeks, that they gave Hamilton a pair of first-round draft picks in the deal. 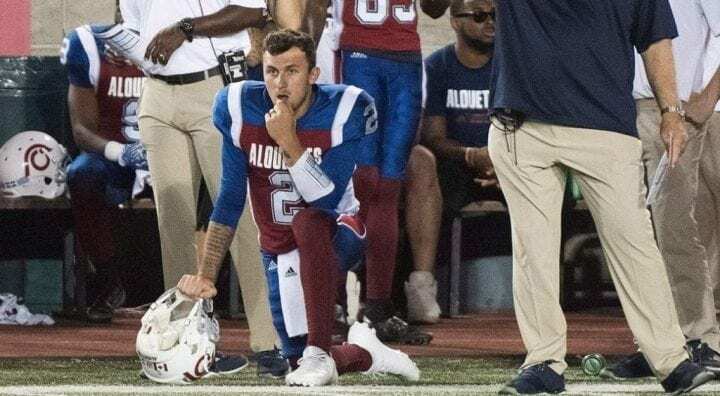 Manziel sat on the bench last week in his first game with the Alouettes. He had appeared in a pair of preseason games for Hamilton, but sat behind Jeremiah Masoli, one of the CFL’s top QBs. Manziel really hasn’t raised a sweat under center since the Browns finally had enough of him three years ago. “It’s good to be back in here,” Manziel told the Canadian media on Tuesday. “I felt like the thing I’ve been missing, even over the course of this year and a couple years, is reps. And as you guys have seen the last couple days, a chance to get with the 1s and get some reps is what I feel like I really need and what I’ve talked to a lot of people about. He should be. Throughout the history of the CFL, its marquee quarterbacks have regularly spring-boarded into the NFL. Think Jeff Garcia, Doug Flutie, Warren Moon, Vince Ferragamo, Joe Theismann and the legend himself, Joe Kapp. If Manziel plays well for the remainder of the season, and behaves himself off the field, there is reason to believe that with Sherman’s blessing he will get a chance to make another NFL roster next season. Montreal fans began begging for Manziel to play last Thursday during a 44-23 loss to Edmonton. “We didn’t trade for Johnny to have him sit on the bench, so obviously, Johnny’s come over here to get reps and become the best player he can become, and we stated that process today,” Sherman told CBC Sports. According to the game reports, the chants for Manziel unnerved incumbent Vernon Adams, Jr., who wasn’t playing all that poorly. He had 217 yards passing, one interception and led the team with 72 yards rushing and one touchdown. If you want to know why Adams may have been particularly piqued, it’s because the Manziel signing was basically responsible for also costing him his job in Hamilton this season. The Alouettes, 3-15 in 2017 after ending the year with 11 straight defeats, are desperately in need of an infusion, having scored have the scored the fewest points (92) in the CFL this season. 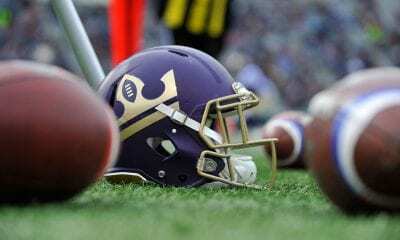 They are also last in possession time and rushing yards and have allowed the most sacks (23) of any team.